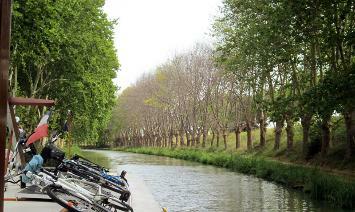 A shady tie-up in scenic downtown Sallèles-d'Aude on the Canal de Jonction - enroute to Narbonne. 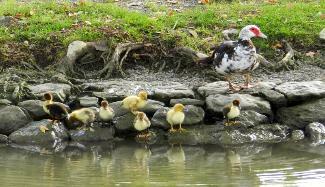 Goslings on the bank in Sallèles-d'Aude. Belle trying to keep a friendly dog from jumping aboard. 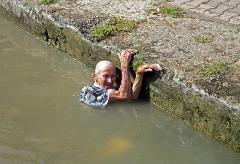 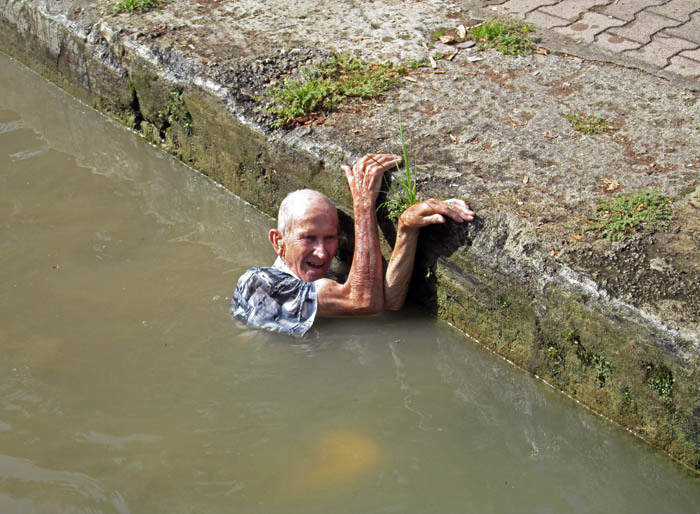 10:40 AM - Dean fell off boat into canal!!! 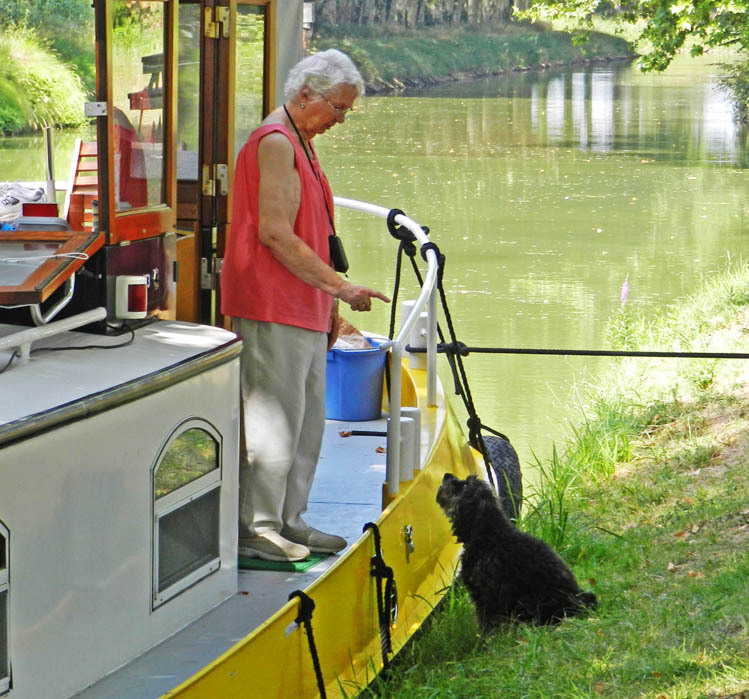 12:30 PM - stopped for lunch, w friendly dog! with only minor scrapes and brusies. been in the 90's every day since we arrived last week. 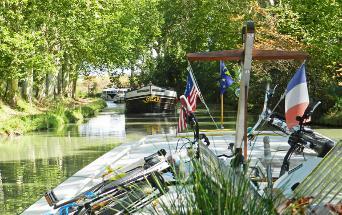 Mini golf and pony rides here. 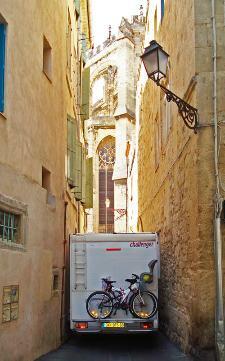 and turned around, just before we got here. 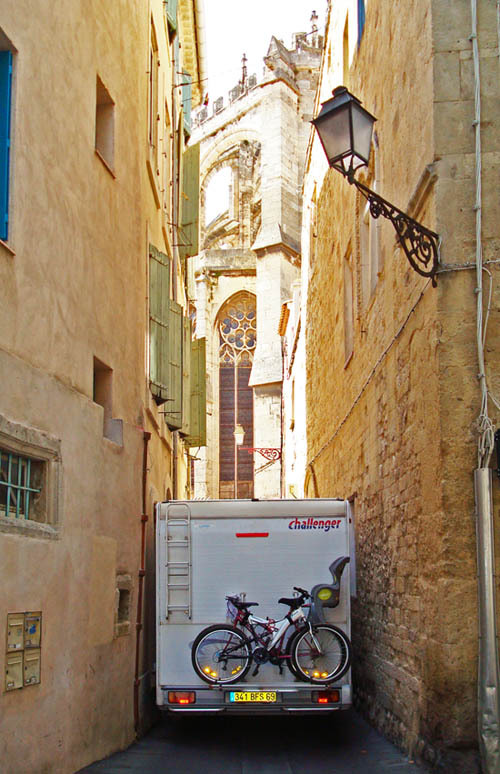 Narbonne streets are no place for a motor-home! 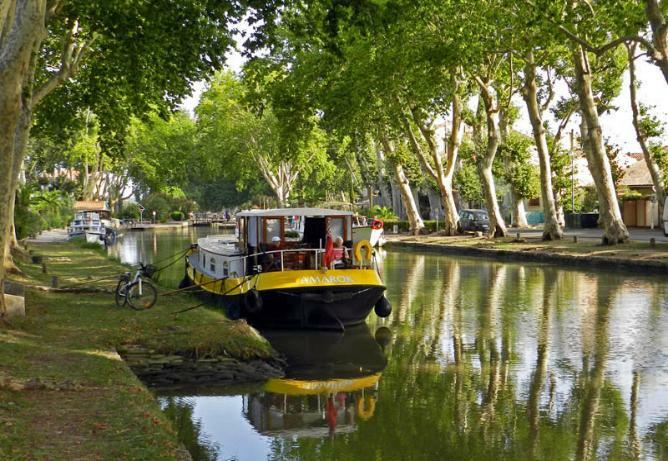 Postcard from NARBONNE... Belle & Dean along the Canal de la Robine. 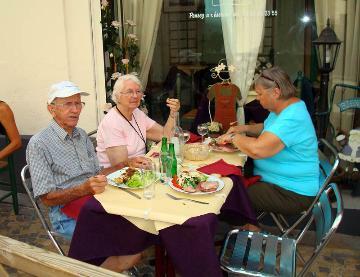 Celebrating Belle's 86th birthday at an outdoor Café in Narbonne. Sunset through the trees in Argeliers. 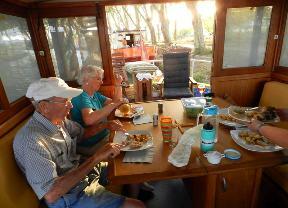 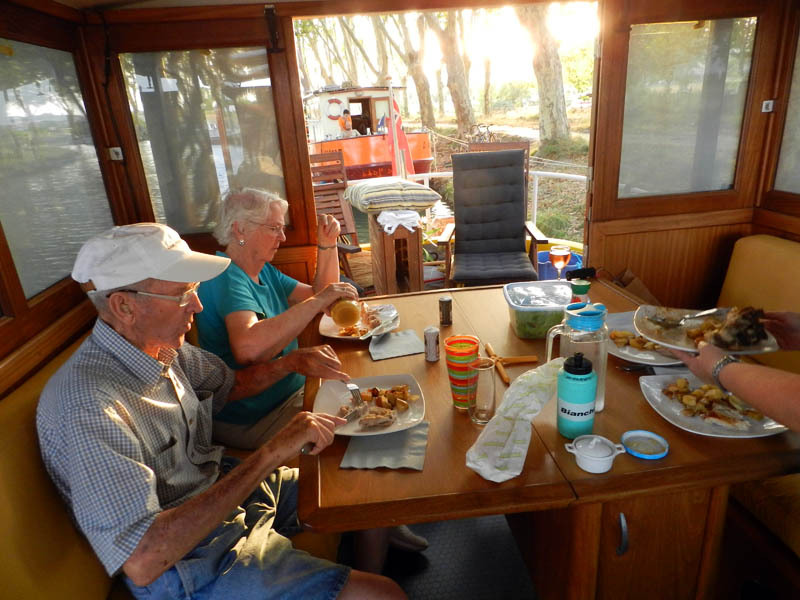 Sunset dinner aboard in Argeliers. 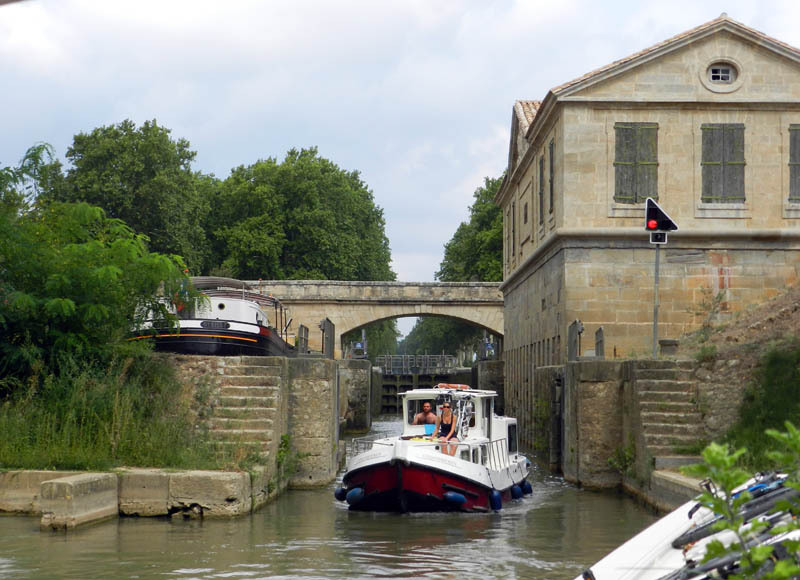 The lock from the River Aude back up in the Canal de Jonction. 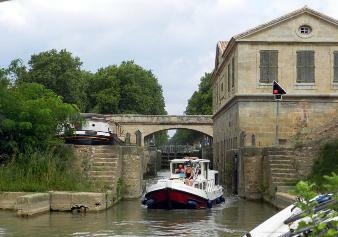 There's a place here to dry-dock a barge by closing the gates. 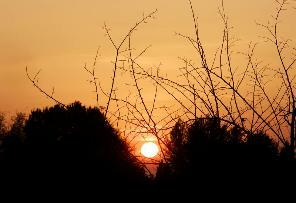 Weather finally turning cooler after 8 hot days. 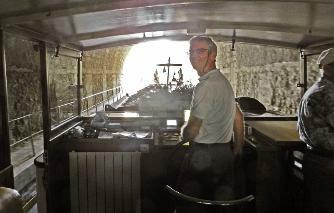 Going under the notoriously low bridge at Capestang. 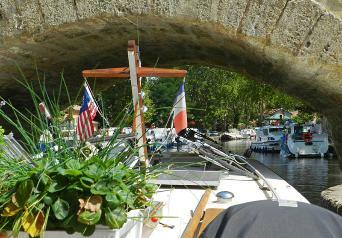 A Locaboat Penichette coming through the Capestang Bridge. 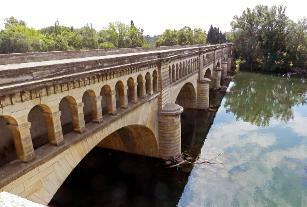 View from the top of the Capestang Bridge. We celebrated a successful passage by stopping for lunch! 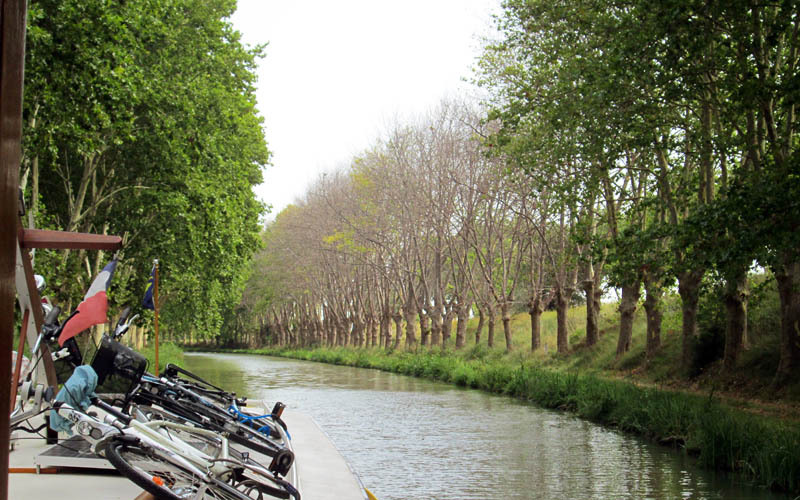 It's sad to see the plane trees dying from an infectious fungus. 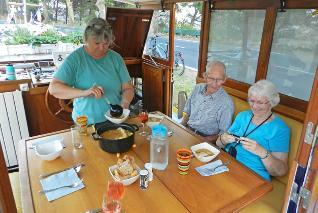 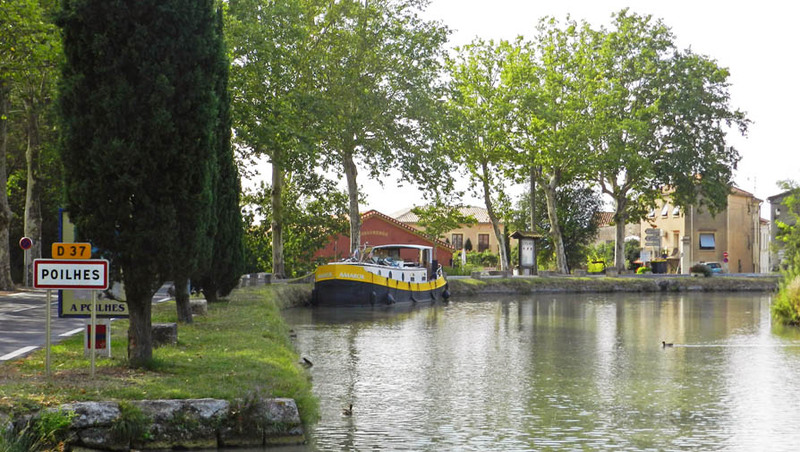 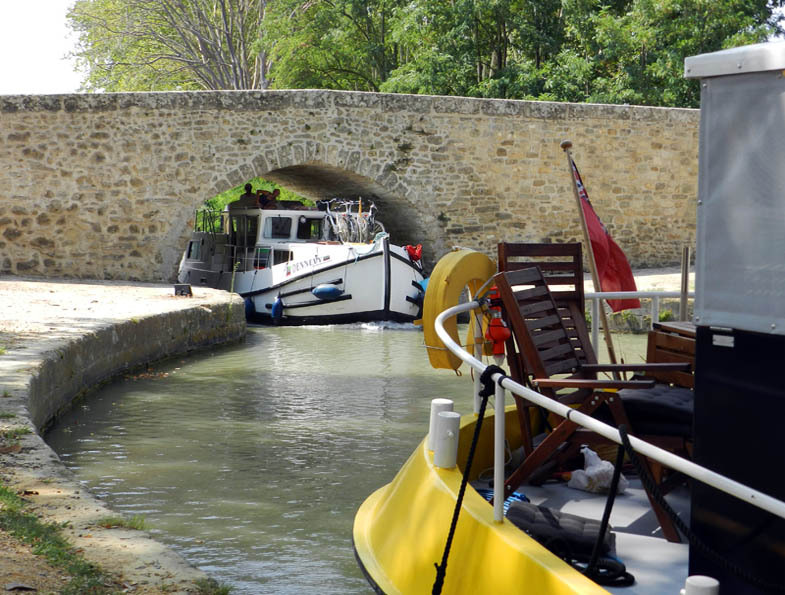 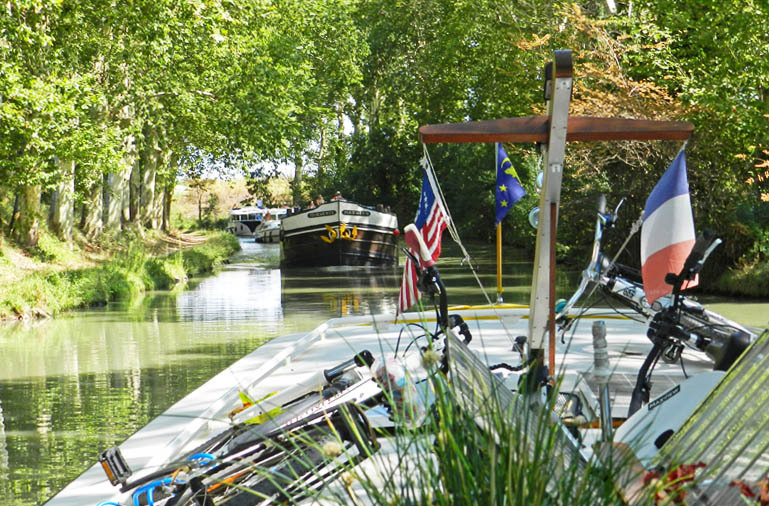 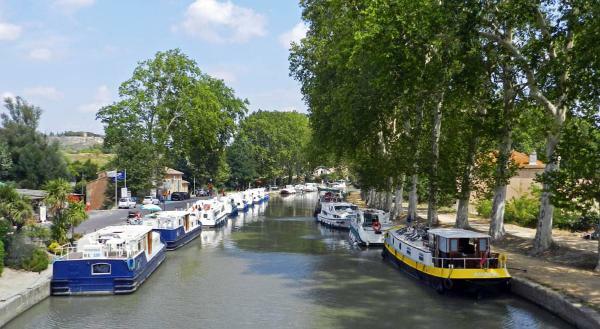 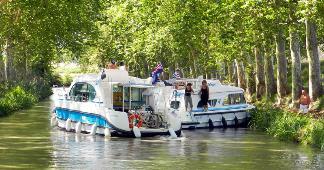 Our tie-up at the Port-du-Plaisance in Poilhès, our next stop along the Canal du Midi from Capestang. guests. 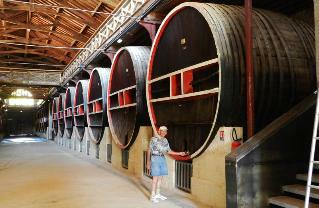 Meanwhile, Belle is happily checking her pics of the day. Heading through the Malpas Tunnel on the Canal du Midi. 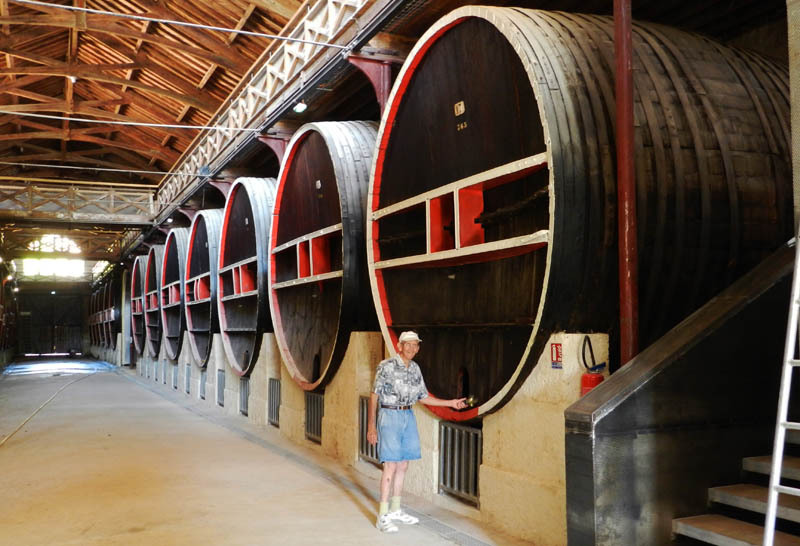 Dean tapping a giant wooden wine cast in Columbiers. 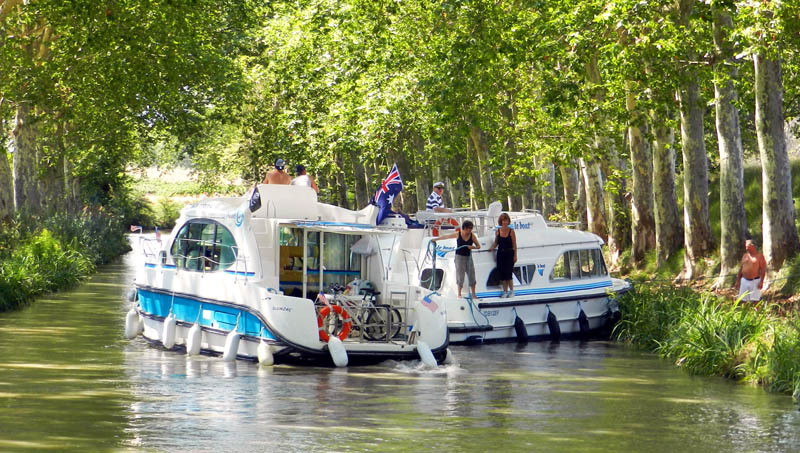 A tight squeeze when you meet a hotel barge on the Midi. 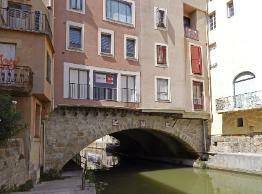 The Canal Bridge over the River Orb - built in 1695! 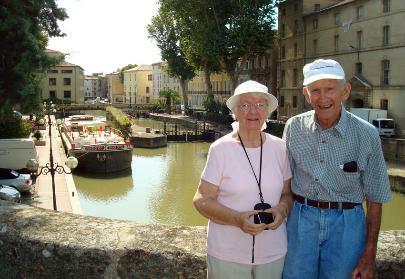 & Dean, continues on August 2012 - Page 3.